Bunny's pap bought and put up a few sweet little surprises for her, her cousins, and her playschool friends! Here is one of his surprises! They have yet to find the other one! I love that my whole family wants to help make childhood an magical, enchanted time for the little ones! What a WEEK at Eco-Kids Tuesday!! We had a record 93 posts shared!! I am amazed and inspired by all the wonderful, eco-happy ideas. 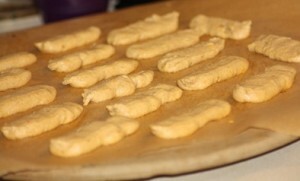 Simple Foody shared a recipe for Soaked Banana Pumpkin Baby Biscuits that are gluten free! Small Footprint Family shared their Healthy Probiotic Fruit Candies with us. I recently bought some grass=fed gelatin, so I am hoping to try making these soon! 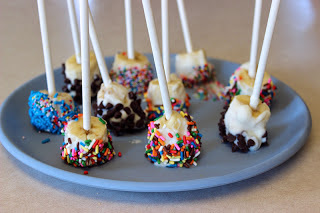 We Made That shared a quick, healthy treat: Frozen Yogurt Banana Pops! I plan to skip the sprinkles for a sugar free treat! Herbal Medicine Kit-Bites, Stings and Splinters! Teach Beside Me shared a wonderful post on Gardening with Kids! If you were featured please feel free to grab a button for your blog. 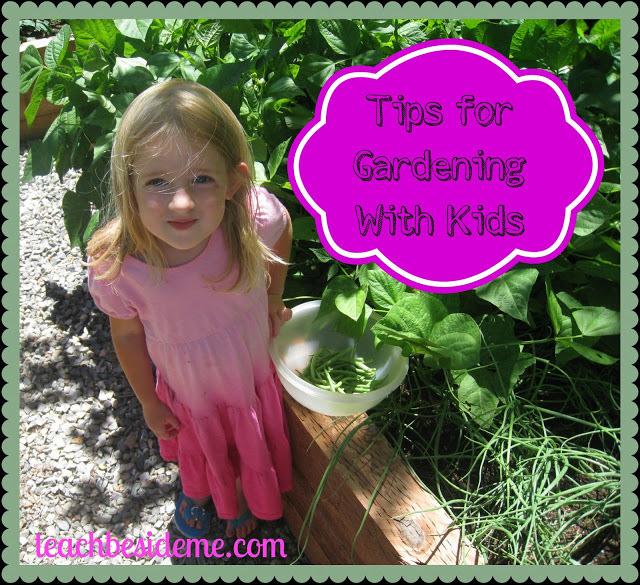 And please keep linking up great all your Eco-Kid ideas! Sorry about the delay in getting the code up and running!! 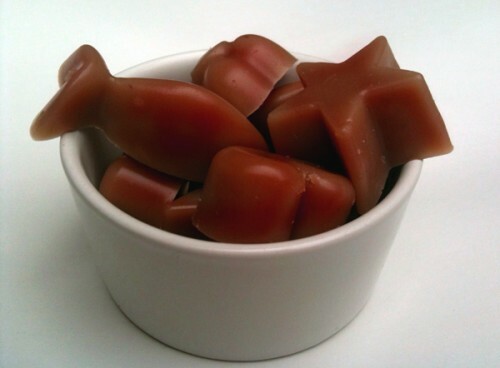 I love making jiggly treats out of grass-fed gelatin. We mix with kombucha, coconut water, fruit, applesauce, etc. These treats will be a welcome addition! Oh we love tree faces here, so much fun!!! another tree face on the nature path. and nana has some fairy house plans of her own! Thanks for sharing our healthy banana pops! And I LOVE that face on the tree! I bet the kids were so excited when they saw it! Can't wait to see what the other surprise is! I checked yesterday and couldn't link up so I'm glad you reminded me to go back and link up. I'm sharing my sumer preparedness post as well as a post on essential oils and snake bites..We saw our first rattler this year already so it is best to be prepared. I will be sure to check outthe sake bite info. Thanks! The tree's are such a great idea! Thanks for hosting another fun hop! I gotta tell you, I love those trees. This week I am sharing another fun herbie craft for kids, sock baths! Hannah thank you so much for stopping by Hen & Chicks today and extending the invitation to your blog party! I have 3 boys that are 17, 15 and 13 so I love seeing all your pictures of kids outside enjoying Creation! Plantain salve is good for treating a bee sting, diaper rash and even a burn/cut from shaving. SO cool! It's sounds all exotic and everything but it's SO easy to make! Oh wow what a fab tree. That tree looks full of magic! Linking back with you with Country Kids for all our eco birthday games. Enchanting!! So lovely the whole family is involved in outdoor play!